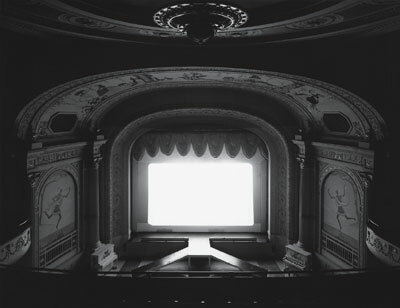 Hiroshi Sugimoto, Cabot Street Cinema, Massachusetts, 1978, black-and-white photograph, 16 5/8 x 21 1/4". OF ALL OF HIROSHI SUGIMOTO’S photographs, some 120 of which were recently on view in a retrospective at the Hirshhorn Museum and Sculpture Garden in Washington, DC, I like best the blankest and emptiest of them, the seascapes and the movie screens. Paradoxically, these are also the least photographic of his photographs, at least as I understand the photographic: as a field of indexically registered, automatic detail, which tends toward a chaos principle of frozen momentariness and punctal oddity. There is none of that anywhere in Sugimoto’s work, but least of all in these flat seas and glowing white screens, which do their utmost either to empty the photographic field of all detail or to consign it to their dark peripheries. Strange that I should like these, for I have always had great affection for the chaotic photograph and its uncanny detail.